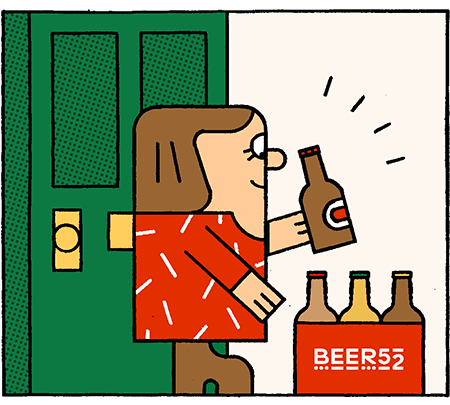 Before I began working at Beer52, I knew very little about beer. I’m not ashamed; we all have to start our journey into beer exploration somewhere and I’m glad I’ve had my eyes opened. At heart, I’m a whiskey lover; my tipple of choice typically being a smooth bourbon. In the time before Beer52 (long, long ago) for me, there was ‘beer’ and there was a delicious pint of the black stuff (Guinness). Of course, I had drunk the usual bland lagers at festivals when I had inevitably run out of whiskey and my taste buds had given up all hope of a palatable beverage, but that was my entire exposure to beer until approximately six months ago, then everything changed. Within my first week I had been introduced to pale and amber ales, double and triple IPAs, saisons, sour beers, porters and a variety of stouts. And who knew you could put fruit in a beer?! My mind was blown. I never knew beer could taste so good. I’m extremely lucky to have our amazing and imaginative editor, Rich, on hand to listen to my crazy ideas, and somehow make sense of them. He suggested using oak chips. I also had the support of the ever-knowledgeable Theo from Brewstore in Edinburgh, who took the idea on board, set the challenge of creating an imperial stout (using the oak chips to give the bourbon hit) and provided the recipe and main ingredients. With the wheels finally in motion, we begin by filling the Grainfather with the correct amount of water and heating it to the optimum temperature before slowly adding our mammoth amount of grain and stirring constantly. This is hard work – it’s a big beer we’re making, requiring a lot of fermentable sugar, so once all the grain is added it resembles a very hefty bucket of rather questionable granola. We leave the mix to mash for an hour before lifting the inner container and resting this on top of the Grainfather, then we slowly poured in the 19 litres of hot water to rinse (or “sparge” the grain). I say slowly, purely because the grain was so dense it took up to five minutes to rinse through two litres of water, and we didn’t want to overfill the container. Once we got every drop of delicious wort from the grain, we added our first bag of hops, which provided most of the bitterness to the brew and thirty-five minutes later we added the second bag of hops to provide the aroma. The wort then boiled for an additional 25 minutes before we cooled and transferred it to the carboy to ferment via a large amount of icy water. After taking a break to let the wort cool down we pitched the yeast and left the wort to ferment at the ideal temperature (between 18 – 23 degrees). In the meantime, we are sanitizing the oak chips to add in the next few days, and the chips will provide a smooth, delicious whiskey flavour to the already sweet, velvety brew. Once fermentation has completed it’s anticipated to hit approximately 8.9% abv. Possibly the booziest office brew so far? The purpose of doing this every month was to share our common homebrew snafus, as well as our triumphs. The carboy of green slurry that we ended up with after a fortnight of fermentation definitely falls into the latter category. At some point, we must have knocked the hop filter off the pump inlet on our Grainfather, because all the pellet residue was sucked through and ended up sitting there for the entire fermentation, resulting in a beer which was horribly bitter, vegetal and generally rotten. It also resulted in a morning of stripping the Grainfather down, cleaning and building it. Oops.